Hi I’m John and my Dorset-based family business is Staglers. We sell deer antler dog chews to pet owners online. I cut the (naturally shed) deer antler into different sized chews for different sizes of dogs. However, I’ve recently seen an increase in searches online for customers wanting to purchase Whole Deer Antler, so it makes sense to sell these too! So what on Earth do people want whole deer antler for? Interior design is a fast paced fashion industry and luckily ‘Countryside’ fashion has always remained a popular ‘thread’. A few years ago I was approached by our social media assistant’s Mum, who is an Interior Designer in the retirement sector. She was working on a design project for a development near a countryside estate on the outskirts of London. The scheme for the show flats was, you guessed it, Deer! The client wanted a large pair of deer antlers to hang as a wall decoration, and I’m happy to say I was able to supply them! 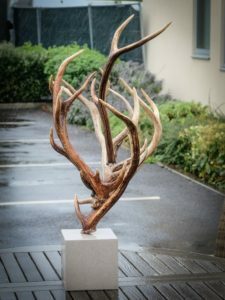 The design scheme was so popular it was then replicated at another development, so as a result we popped another pair of antlers in there too. We think they look rather impressive! Okay, so nobody is going to stick a whole deer antler on a pen! That would be a little extravagant – and heavy! However, I wanted to include another creative, decorative use for them. These beautiful antler pens were created by Graham at About Turns. These wonderful sculptures are the creative work of Nadine Collinson. 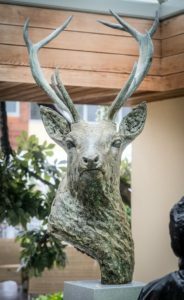 Nadine first got in touch a few years ago as she wanted to make a full size bronze of a Stag and needed a pair of antlers to work from. I supplied them and I think you’ll agree the finished work is stunning! Since then, Nadine has been one of the main artists putting together the Graze Festival in Winchester. This year (2018) I supplied her with a whole pile of antlers for her to make the stand-alone pieces. This is a little decorative idea I came up with myself. I just love the idea of bringing beautiful natural items into the home to display, as long as they are ethically sourced of course! For Christmas I pop a few candles and freshly cut holly between the antlers and I think they make a wonderful centre piece because they just add something more ‘exciting’ than your standard table setting. In conclusion, antlers aren’t just for dogs; humans quite like them too.